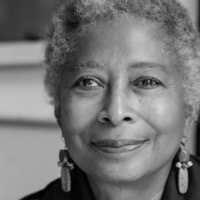 Alice Walker is a celebrated writer, poet, and activist with a prolific career spanning 50 years. Her books include Revolutionary Petunias and Other Poems (1973), Horses Make a Landscape Look More Beautiful (1985), The Temple of My Familiar (1989), The Way Forward Is with a Broken Heart (2000), Now Is the Time to Open Your Heart (2004), and many other works of fiction, poetry, and nonfiction. Walker's book The Color Purple (1982) is set in the 1930s and tells the story of Celie, a young wife in the rural American South, and her sister Nettie, a missionary in Africa. The book won the Pulitzer Prize and the National Book Award for Fiction and in 1985 was adapted into a film of the same name, starring Whoopi Goldberg, Danny Glover, and Oprah Winfrey. Walker's 1989 novel The Temple of My Familiar follows a cast of interrelated characters of African descent and was described by the author as "a romance of the last 500,000 years." Her nonfiction book We Are the Ones We Have Been Waiting For: Inner Light in a Time of Darkness (2006) draws on Walker's spiritual grounding and progressive political convictions; each chapter closes with a recommended meditation to teach patience. Her most recent book, Taking the Arrow out of the Heart (October 2018), is an English/Spanish collection of nearly 70 works of poetry that bears witness to our troubled times. Walker's writings have been translated into more than two dozen languages, and more than 15 million copies of her books have been sold worldwide. Walker was awarded the Mahmoud Darwish Literary Prize for Fiction in 2018 and has devoted much of her activist work to supporting the people of Palestine.